Identify trends in the multifamily residential market that are driving consumer demand and continued development. Investigate the design potential and innovative opportunities to create building facades that combine high aesthetics with high performance. 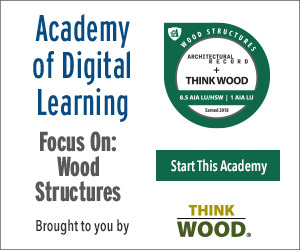 Assess the innovative ways to incorporate design strategies for outdoor spaces and indoor/outdoor connections. Determine the opportunities for improving floor structures, underlayments, and finishes that can enhance the multifamily living experience. The news on multifamily housing remains good. The largest lenders in housing, Fannie Mae and Freddie Mac, expect to break more records in 2016 in their lending on multifamily properties. They both had a very busy 2015, and according to John Cannon, senior vice president of multifamily production, sales and marketing for Freddie Mac, “I think our activity is going to be higher in 2016 than last year.” That is impressive since Freddie Mac lent $47 billion to apartment properties in 2015, which was up more than 66 percent compared to 2014. Fannie Mae wasn’t far behind, lending $42 billion in 2015. All of these numbers and trends are interesting because their federal regulator, the Federal Housing Finance Administration (FHFA), has set limits on how much they can lend to multifamily housing at $30 billion. Those limits came from the government seizure of these two lending agencies during the recent financial crisis. However, in 2015, those limits loosened such that lending to affordable housing properties and “workforce” housing properties no longer counts toward their $30 billion limits. Strong demand for loans for this type of housing as well as others was the main reason that Fannie Mae and Freddie Mac lent so much in 2015. With the ability to lend to a wide portfolio of properties beyond their otherwise imposed limits, they are poised to continue to meet that demand in 2016. Driving that demand are developers who are in turn responding to a very robust market. Instead of just catering to luxury high-rise projects, it seems that a mix of settings, building types, sizes, and amenities are all responding to different market needs, as people of all ages seek multifamily living environments suited to their lifestyles. As architects and designers of these new and renovated buildings, it behooves us to stay abreast of available options, systems, building components, and features that we can bring to multifamily projects. Accordingly, we can satisfy both the developer clients and the end users who will live with and in the vibrant spaces we create as part of a larger community. Multifamily housing that offers up-to-date features and amenities remains a significant part of the construction market, both new and renovation, because demand is high all across the United States. Let’s start by looking at the exterior of multifamily buildings. This is an area where aesthetics and curb appeal loom large in the interest of marketing a project and providing some satisfaction to those who live there. Additionally, the exterior systems make up the building envelope, which needs to provide the requisite barriers for air, vapor, weather, and thermal control. Successfully bringing the aesthetics and the performance together requires attention to both the overall design and the details. Some examples of systems that do just that follow. Exterior cladding with various types of aluminum trim contribute to a wide variety of exterior design approaches for multifamily housing projects. In the interest of satisfying aesthetic solutions that support human scale as well as cost effectiveness using lightweight materials, many new types of exterior cladding materials have entered the market. Some are thin composite panels, some are ceramic, and some are metal. They all offer different visual choices and evoke different design strategies depending on how they are used, but they all need to be mounted and held in place appropriately. Further, they need to have the panel edges addressed to create trimmed or trim-less appearances, or if siding is used then some trim is needed to contain the edges. Recognizing the varying design needs, there are panel and siding trim systems available that cover a wide range of appearances. These include different systems of profiles that can work together to create a total design solution without changing manufacturers. Such trim products are designed to work with most siding, panel, and product offerings so compatibility should be fairly straightforward. Different finishes are readily available, including anodized, painted, powder coated, and primed, allowing for a scheme of matching or contrasting appearance. This means architects have the ability to detail the exterior with different options, from wide horizontal breaks, verticals that are accented or fade into a monolithic form, and corners that offer open reveals or closed sharp angles. An alternative to smooth-surfaced cladding panels, manufactured stone veneer can add texture to multifamily building facades. As a lighter-weight product than full thickness stone or masonry, it can be incorporated into projects of all types and sizes with about half the weight and cost of natural stone veneer. Further, manufactured stone provides greater quality control on color consistency throughout a large project.Manufactured stone veneer has become popular for part or all of a building facade in multifamily projects for a variety of reasons. First, it is indeed a stone product, making it very durable and able to stand up to the rigors of a heavily used building. Second, it is easy to detail, with a full line of manufactured accessories available to allow realistic transitions across corners and other building conditions. Third, it is easy to install, including the option to panelize to make installation quick for large projects. Quicker installations mean shorter building construction times, which usually translates to cost savings. Compared to natural stone, architectural stone veneer provides the advantages of lower weight, easier installation, less waste, controllable color palettes, and lower price. Natural materials like stone not only speak to environmental awareness, they evoke a sense of connectivity to nature. Stone’s inherent characteristics of texture and warmth have been used on buildings to help define and highlight the design of both interior and exterior wall surfaces. As such, architects and designers have been able to incorporate products that transform ordinary environments into unique and memorable spaces. There is an abundance of choice and variety available with dozens of stone profiles and more than 150 different colors on the market, offering a full range of palettes, shapes, and textures. Architectural stone veneer can be applied to interior or exterior locations in multifamily buildings. Selecting the right stone and color can make the difference between an ordinary project and a true showcase. Stone textures, styles, and color palettes range from contemporary clean lines with monochromatic colors to rustic irregular shapes with rich, bold color variation. Manufacturers stay innovative by working closely with designers and architects to develop new stone profiles and colors, which drive the trends in the industry. Architectural manufactured stone veneer can be used creatively in a variety of ways to enhance the texture and color of a multifamily building facade with quicker installation and less cost than conventional stone. With this understanding in mind, there is a new segment in building wrap materials that creates such a gap by using an applied surface treatment to the wrap. This produces a micro rainscreen and a fully functioning drainage plane behind the cladding and in front of the substrate. Properly detailed and installed, this type of drainable building wrap helps to handle the moisture that is inherent in exterior wall assemblies. Combined with a compatible tape for the seams of the building wrap, it helps maintain a continuous, overlapping, secured installation. This is the preferred approach for effective moisture management by many members of the building science community. Jon Standley, the project manager for a multifamily project known as Texan 26, notes, “This approach was chosen for the effectiveness as a drainage plane under multiple siding products and for maintaining its gap once installed.” It is expected to help keep the facade performing properly and looking good not just at first installation, but for many years to come. Strategically located spacers provide an intended drainage gap on a synthetic, non-woven, breathable building wrap product. The Modern Collection by Eldorado Stone accentuates contemporary designs, as these stones pair refined color with clean lines to blend or contrast with neighboring elements. Minimal. Sensible. Perfect. Balanced. A natural showcase for palettes of wood, steel, concrete, or glass. The results are spaces that come alive. Sound Buffer is a high-performing universal acoustic underlayment made from 100 percent virgin latex rubber for use under luxury vinyl, laminate, engineered wood, and hardwood flooring. It can be floated, nailed, stapled, or single- or double-glued. Versa-Dek® is a long span floor deck that provides steel/concrete composite action to achieve open floor spans up to 28 feet. In addition to a clear span, the system addresses aesthetic, acoustic, and fire-rating demands, while minimizing the total project cost and the owner’s building life-cycle cost. XtremeTrim® is a line of extruded aluminum reveals for multiple siding systems. With multiple options in reveals and profiles ranging in sizes from 5⁄16 inch to 1 inch and the ability to create custom extrusions and varying finishes, we are in the business of providing the design community with solutions. Everyday doesn’t have to be ho-hum or boring. Transcend offers designs and color options created to coordinate seamlessly with other Tarkett floors. This flexible palette allows you to bring together an unlimited array of features and styles. Style and design: upping the wow factor. As one of the largest manufacturers of lightweight commercial-grade pots and planters in the United States, our fabrication and project management skills make the most challenging projects look easy. Whether custom or standard, our quality makes you look good. Most of our pot collections feature a full range of shapes.